Boy Oh Boy have I been looking forward to this film. Neill Blomkamp sprang to our attention with his 2009 film District 9, which was nominated for four Academy Awards including Best Picture. Despite his follow-up Elysium being met with slightly less enthusiasm by critics and audiences, I found it a brilliant and compelling piece of social commentary as well as being one the year’s best blockbusters. So I’m truly gutted to write about this new film in ways that are less than glowing. 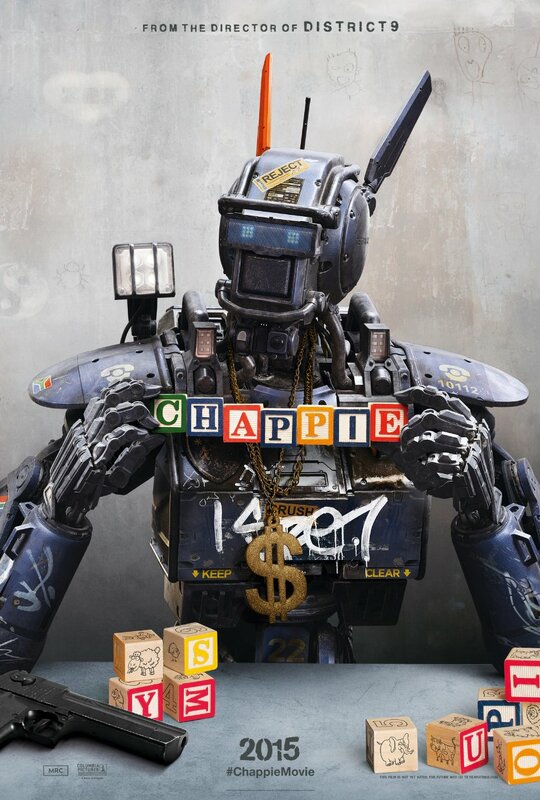 Set in 2016, with some of the events taking place “18 months ago”, Chappie tells the story of Deon Wilson played by the charming Dev Patel, a young computer programmer and robotics whizz-kid who works for a weapons manufacturer. The South African Police Force has recently successfully activated a squad of robot officers designed by Deon, and he is so keen to continue developing his ideas that he goes against the wishes of his boss – Michelle Bradley played by Sigourney Weaver, and rescues a damaged model – number 22 – to work on in his spare time at home. On the way home Deon is kidnapped by a group of thugs who are seeking assistance in pulling off a heist, and he must fast-track his reject robot into existence before its battery runs out. A massive bogan with a mullet and an aggressive attitude played by Hugh Jackman is fellow weapons developer Vincent Moore, , who has been developing his own line of mechanised police units, without the same success rate as Deon’s “Scouts”. When the crime gang first interact with Deon’s experimental robot, they dub it a “happy chappie”, and thus “Chappie” is born. The visual effects are absolutely brilliant, with Blomkamp collaborator Sharlto Copley acting out the titular role of the robot before being animated for the finished product. And it’s here that one of many red flags in the casting department appear. Copley is too much of a talent to waste by computer animating him out of the film. Similarly, Sigourney Weaver has come a long way from her role as Dana Barrett in Ghostbusters, and asking an audience to accept that the head of a weapons manufacturing compnay would not encourage Deon to develop his profitable ideas further is just ludicrous. The awesome Hugh Jackman as a scheming bad guy doesn’t work, when we know him to be a man of good character. Even if Wolverine is a troubled fellow, Jackman’s onscreen capability for wrongdoing is minimum at best, but in this film he is out for blood from the get go. Dev as Deon is also difficult to buy, because it’s hard to take seriously that a guy this bright could be stupid enough to jeopardise his livelihood by stealing from his employer. Perhaps the most grating aspect of the film (aside from it’s difficult to believe narrative) is the casting of Die Antwoord members Ninja and Yolandi Visser. These two play the roles of surrogate mother and father to the “baby” robot Chappie and their performances are so loud that they contribute to an overall feeling that the cast and the characters they inhabit make it extremely difficult to relate to anyone in the film at all. Part of me wonders if the whole film is some elaborate prank cooked up by Blomkamp, because it falls far short of what he’s raised his fans expectations to be. An enormous disappointment to say the least. So Hugh Jackman wasn’t effective because he is a nice person in real life, and plays a character in another film differently? It is hard to believe a person who’s life’s ambition is to create artificial intelligence, after a night of no sleep and a eureka moment would take a piece of equipment about to be destroyed to complete his dream?